Random ideas and images. Fashion, decorating, style...whatever I find beautiful. IMG_9523, originally uploaded by Pink Lady on the Loose!. Chanel, one of our cats, enjoying her breakfast. I had just cleaned the feeding area so had to take a photo. 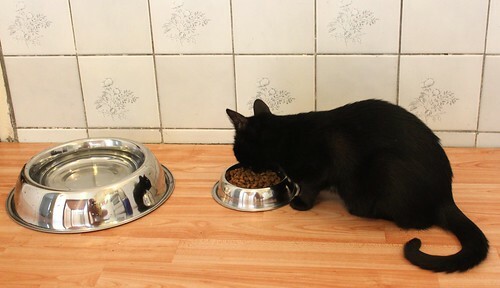 It stayed clean about two seconds, because cats seem to be unable to eat without spreading the food all over the place. Usually some ends up in the water dish too. I consider myself something of a "Renaissance Woman". I'm interested in many things and have trouble choosing what to concentrate my energies on. Announcement: Slash Backslash 2.0 Winners!